The Great Day of Judgment, which is an event in the future, at the end of history as we know it, when all who lived are resurrected, and are judged whether they are worthy of everlasting life in a spiritualized renewed physical world (according to most authorities) to frolic in the splendor of God’s Presence. All this judgment strikes the contemporary mind as backward, even offensive. It only reinforces the stereotypic image of “Old Testament” Judaism as a religion of fear, not love. Well, yes, judgment — whether on Rosh Hashanah, the Day of Death, or the “Great Day of Judgment” — contains the general air of awe and seriousness. There is no sense trying to sugarcoat or diminish the magnitude of these events. Nevertheless, what’s often lost to the contemporary mind is the liberating experience judgment entails. Perhaps the best illustrations of this are found in a surprising place. 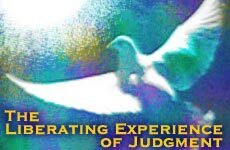 This entry was posted in Afterlife, Emunah/Faith, Holidays, Jewish Thought, Soul Searching, Yom Kippur and tagged Day of Judgment, Days of Awe, Judaism, Judgment, Life Review, NDE, Near death experience, Repentance, Teshuva, Teshuvah, Yom Kippur.